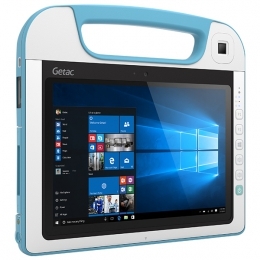 Getac developed the RX10H tablet PC for the special requirements in healthcare. It features an anti-bacterial surface coating and withstands daily cleanings, even with harsh chemicals. Thanks to the Intel Core M processor and 4 GB RAM it promotes itself to the position of powerful assistant for numerous areas in the laboratory and in hospital environments. The 10.1 multi-touch display, full HD resolution and a brightness of 800 Nits ensure for consistently good readability, even under poor lighting conditions. Even in damp conditions it responds reliably to handling with your finger, a pen or gloves. Impacts, vibrations, liquids and dust are no problem for the fully rugged tablet. It is certified according to MIL-STD810G and IP65 standards to keep working, regardless. Thanks to its highly ergonomic shape - just 1.2 kg, less than 2 cm high and including a handle - the RX10H is ideally suited for daily continuous operation. The tablet and included power supply are specially certified for healthcare, to ensure for safe handling.